1985 Mercedes-Benz 190D - I've always been a fan of the W201 Mercedes-Benz cars, known as the 190 Series or "Baby Benz." Built to compete with BMW's 3 Series, it never really caught on with the American public like the 3 Series did, even though it was incredibly well engineered and built like, well, a Mercedes-Benz. During its run, the 190 came with a variety of engines, including 16 valve Cosworth engines that put the 190 into M3 territory. This is not one of those cars. This car has a 2.2 liter diesel engine in it. It puts out just over 70HP and it will take you around 17 seconds to get to 60 MPH. Top speed is 100 MPH. But, it gets over 30 MPG around town and close to 40 on the highway. Best of all, the engine is damn near indestructible. 500K miles without a rebuild is not unheard of. This 190D has roughly 180,000 miles on it. It has a 5 speed manual transmission. The current owner seems to have maintained it well. Personally, I'm partial towards red cars, and think this one looks great. The seller is asking top dollar, but if the car is as good as it appears to be, it is worth the money. 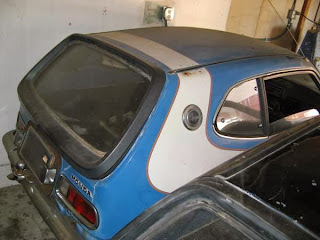 (2)1972 Honda Z600 - The Z600 was the offspring of the N600, the first Honda officially imported to the US. The Z600 featured a 598cc 2 cylinder engine that produced 36 horsepower. Top speed was around 80 MPH. It took around 30 seconds to reach 60 MPH. They are tiny (3 feet shorter and 400 lbs lighter than an air-cooled VW Beetle), and the engine revs like crazy, which - despite the lack of power - makes them fun to drive. This is a twofer sale. 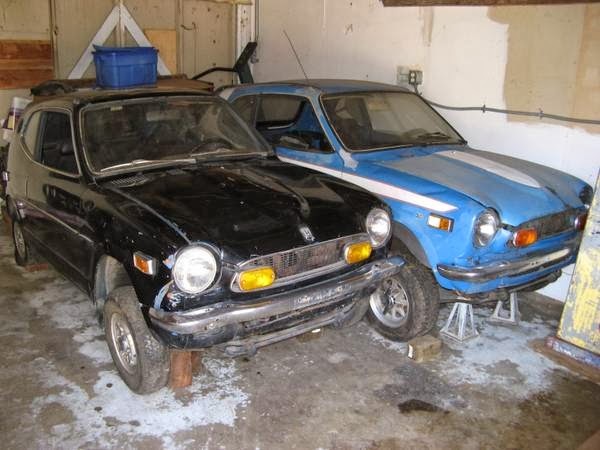 The seller has had both of these cars for 8 years and never got around to restoring them. They look to have some surface rust, but the seller is saying they're rust free, I assume meaning that they have no holes. Both of these cars are restorable. Surprisingly, parts for these cars are still pretty easy to find. The value of these cars is increasing, and it's possible you'd be able to sell one to finance the restoration of the other. Located in Soquel, CA, click here to see the Craigslist ad. I've owned many diesels including 3 524td's, rabbit diesel, modern jetta, and a 190d. Personally, the 190d is amongst the worst cars I have ever owned. Even by diesel standards these things are slow, I mean dangerously slow. It is also one of the most uncomfortable cars I have ever driven. Uncomfortable seats, giant steering wheel, more that I have forgotten. Awful climate control, noisier than any diesel out there at speed. Hated it with a passion. I would take an old vw diesel over one of these in. Heartbeat.